Pay-per-click (PPC) advertising can be very effective when it’s done well. But all too often, PPC ads simply send visitors to a web site’s home page. In many cases the home page has no content that is relevant to the visitor’s original search query. This frustrates visitors, prompting them to leave the site and lowering your conversion rates. You can dramatically increase your leads and customer purchases by sending PPC traffic to a dedicated landing page with useful information about the topic that attracted your visitor to click the link in the first place. Visitors feel welcome and special when a dedicated page speaks exactly to their needs. For example, The Primm Company designed a PPC campaign for a local furniture retailer that targets a specific metro area several hours away. When searchers click on the ad they are taken to a dedicated page that includes a video introduction. Prospective customers are invited to browse the site, order online, or make a day trip to the physical store and surrounding historic attractions. You can’t find the landing page through the site’s regular navigation, and the wording is unique for the specific metro area, creating a strong, emotional connection. Best of all, it works. The client is getting increased brand exposure in a growing market and more physical traffic coming into the store to make purchases. It’s been so successful that we’re now using analytics analysis and market research to target other metro areas with the same approach. 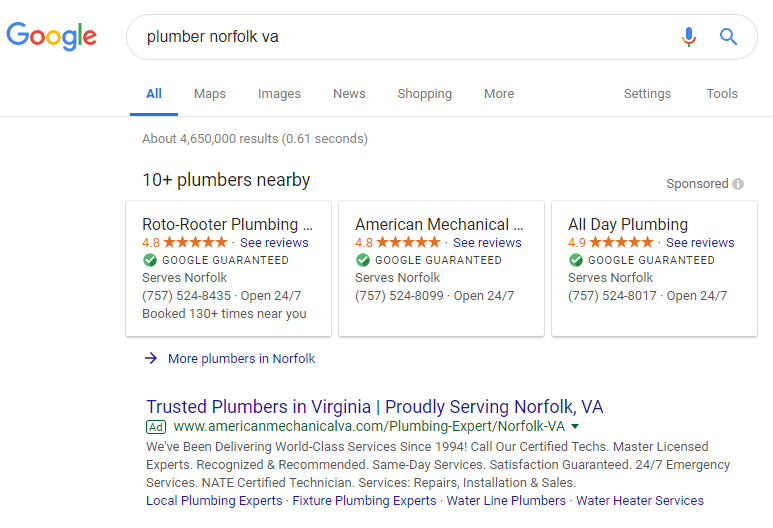 Pay per click advertising isn’t for everyone, but if you think it may be good for your business, give us a call at 757-623-6234. Whatever you do, don’t waste money advertising the wrong way! Facebook is dominating the display ad market in the U.S.
Based on research by comScore, Facebook now possesses an estimated 31.2% of the display ad market, up from 15.6% in the first quarter and 25.9% in the fourth quarter of 2010. Facebook is a terrific platform for branding to a specific audience. Ads can be targeted based on demographic information available in user’s profiles, including location, age, gender, marital status, interest, groups, work places, etc. Ads are only displayed to users in your chosen demographic, you set the bid, and (if you choose CPC bidding) Facebook only gets paid when a user actually clicks your ad and goes to your website. It’s a great tool for brand recognition. Last month, a Primm Company Facebook campaign racked up 4.5 million impressions from users in Hampton Roads! That’s a huge branding reach, regardless of the number of clicks. If you’re interested in building brand recognition to a specific audience, give us a call, (757)-623-6234.